Copra is the dried meat, or kernel, of the coconut. 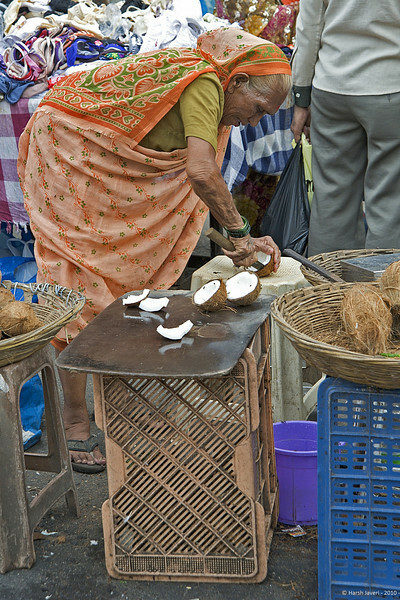 Shot at Colaba market in South Mumbai. Yummy, Copra. Lady has tough hands for sure, Bless her. This is really lovely image and a great slice of life. Great shot Jarsh...This is the kind of 'fresh' albeit 'dried' coconut that I have always been familiar with as opposed to the soft coconut that was scooped out and cut in chunks for us to eat in Guadalajara last month. I did not konw what copra was. Very interesting. I really like your street scenes. Another great street shot. I am enjoying seeing ordinary life in your city.